This time of year, we are busy running around from party to party. We're celebrating the season with co-workers, friends, families, and neighbors. There sure are a lot of parties to attend! It's crucial that you bring a hostess gift when attending, especially when the party is catered or completely hosted (meaning you weren't asked to BYOB or a potlucks dish. You should not show up empty handed.) At More Than Paper, we think a personalized gift is a really great way to thank your host and, of course, we have plenty of those! Though we have shown seasonal favorites, these ideas below work all year long. Choose from ornaments, recipe boxes, candles, desktop calendars, personalized notepads and coasters as some of our favorite hostess gifts! 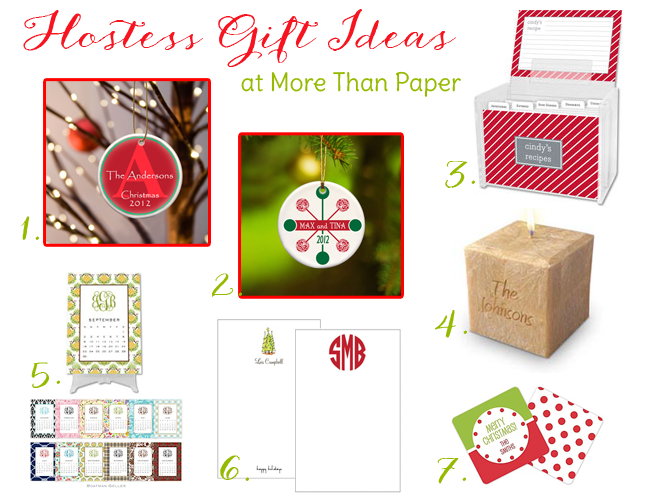 Shop all of our gifts for hostess at More Than Paper! My mother suffered a medical emergency 3 weeks before my wedding date. Needless to say, the original date was not an option. The event coordinator handled the crisis really well. Not having to deal with logistics during this stressful time was so wonderful for my family. Doing gifts for men can be easy but it's hard not being boring. Here's a website that will give you all the right ideas for an original gift for him and for everybody for any occasion. Take a look at it, it's easy to use and most of the items can be also personalised as you like! I love when I'm given candles as a gift. My friend is a writer for the best essay writing websites reviews and she travels a lot. She always brings so breathtakingly beautiful things from different countries!